Want to receive DMS Central emails in your inbox? One View offers leading document scanning and data archiving solutions that enhance auto dealership productivity by giving them easy 24/7 web-based access to and ultimate control over their data. We customize our solution to fit your specific dealership needs from single point store to large dealer group. Stop wasting time searching through boxes or off-site storage units to find misfiled folders. One View puts dealership documents at your fingertips for instant access. Save money by eliminating your papers, file folders, storage boxes, filing cabinets and storage facilities. One View securely stores your data in a way that is easy to search, retrieve, transfer and use whenever and wherever you need access to it. Instantly see all documents related to the search term. Grant various permissions so dealership employees see only the data necessary to their department. Improve your dealership efficiency with intuitive, fast search capabilities to locate any parts/service tickets, service contracts, insurance forms, warranty documents, accounts payable/receivable and other dealership documents. 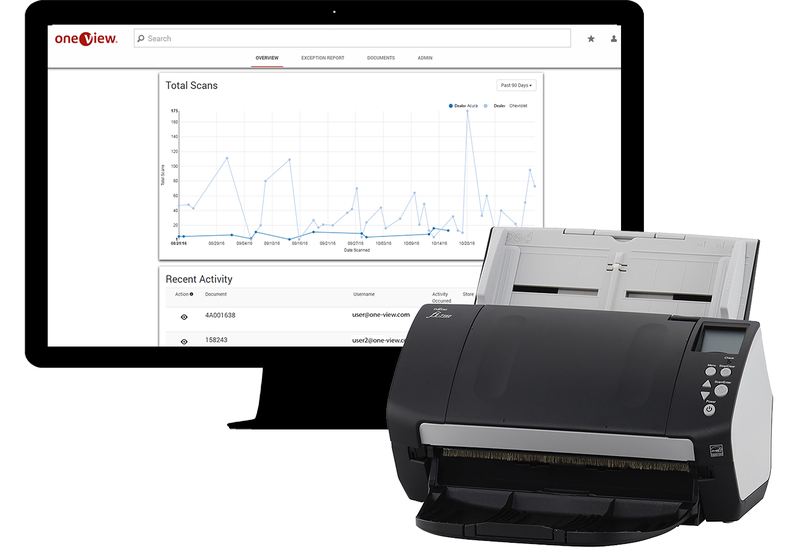 One View is fully compatible with Auto/Mate so users can see which documents are scanned and not matching within your DMS without leaving their desks, eliminating the chance of misplacing and shredding documents. Provide auditors with immediate access to view all documentation needed for your sales and warranty audits. One View’s exception report ensures legal compliance for you to approach your next audit with confidence. Contact us at csm@one-view.com or 317-915-9039.